Awhile ago, when my tomato plants were still growing, I went out to pick some. And on the ground, in between the plants, I heard some rustling. I didn't know what it was at first, until I spotted a cute little baby mourning dove. 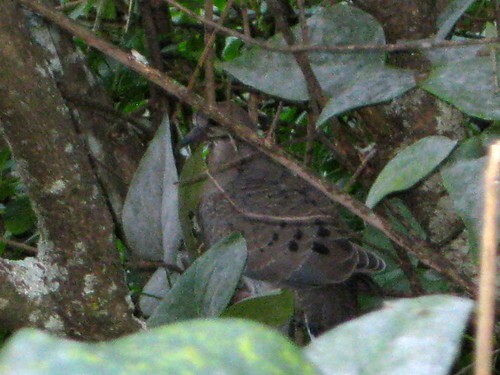 I ran back in the house to get my camera, and was only able to get this one picture, when it flew up into some bushes. The baby mourning dove really blends in, doesn't he? Cute shot of the shy Dove. Wonderful shot. They can blend in so easily with the background. We had baby doves here a few months back and it was really hard to get a good shot of them. Well done! you must have been really sneaky...lol good pic! Great capture, I love to listen to morning doves. That is a beautiful photo! I love mourning doves.